You’ve seen the cartoons. You’ve heard the cliché. But why exactly is there so much animosity between cats and dogs? For starters, it’s not a universal truth. 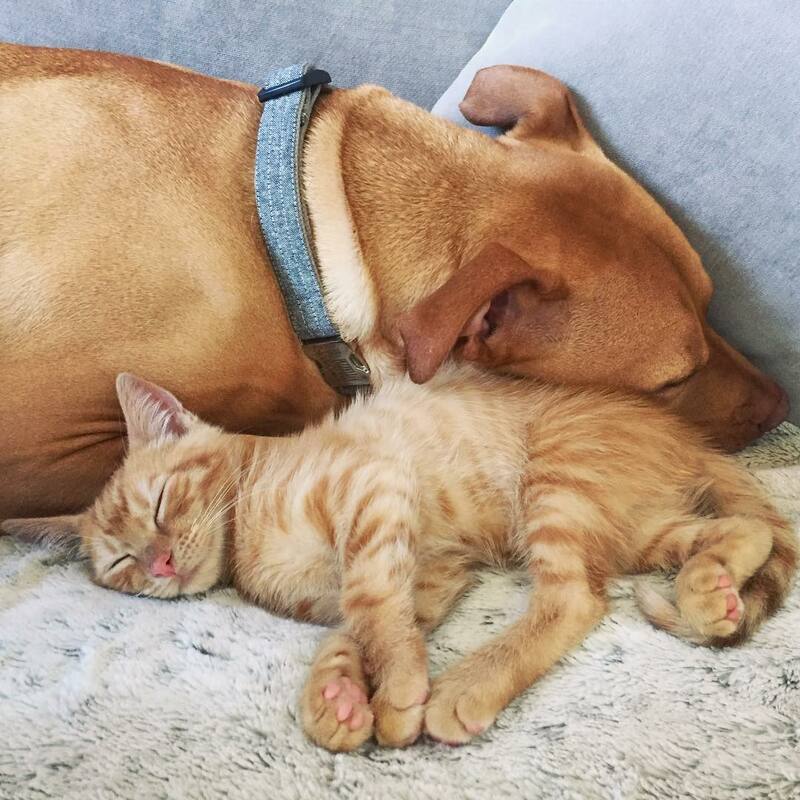 We’ve all seen an adorable GIF or twenty of a dog and a cat snuggling on the couch and eliciting a very well deserved “d’aww.” These cross-species friendships aren’t quite as rare as you’d think, but there are actual reasons behind the widespread belief that dogs and cats just plain don’t like each other. Let’s take a closer look, shall we? As you might expect, the differences between cats and dogs are more than just skin deep. Domesticated dogs are descended from wolves, a highly social animal that hunts and lives in packs. Their cat counterparts, on the other hand, are descended from the Arabian wildcat, which lives a loner lifestyle. When either is the only animal around, this difference simply manifests itself in the way each one behaves towards humans. Dogs will run to the door to greet you, burrow into that nook between you and the arm of the couch hoping for a belly rub, and whine when left alone. Cats…well, cats don’t tend to do any of that. You could own a cat and go days without seeing him; most are all too happy to be left alone to fend for themselves. But if you put both personalities in a room together, watch out. The dog will probably greet the cat just as he’d approach a human stranger: excited and curious to get to know a new creature. After all, his ancestors would have a pack of friends at their back should anything go awry, so that first interaction is fairly low stakes. The cat, on the other hand, might see this harmless approach as an act of aggression and will quickly retreat out of fear – a deeply rooted (and wise) survival instinct. Problem is, the dog doesn’t quite see it that way. Doggo doesn’t know that kitty’s afraid…he thinks he wants to play! Naturally, he chases after the retreating cat hoping to get in a healthy game of tag, but all this does is confirm the cat’s fears that this dog is out to get him. Now you’ve got an angry, hissing, claw-wielding cat standing up to a very confused dog who’s starting to get angry that his new friend won’t play with him. Spoiler alert: this cross-species misunderstanding probably won’t end well, and thus the clichéd cycle continues. The good news is it doesn’t have to be this way. With a little bit of training – and a lot of treats – you can teach dogs and cats to get along amicably. Generally, the dog will need to be taught to act in accordance with what works for the cat, rather than the other way around (cats, amirite??? ), but it’s all worth it if it leads to a new pair of snuggle buddies beating the odds one Instagram post at a time. Do you live in a multi-pet household? Share your stories – adorable and confrontational – in the comments section below!